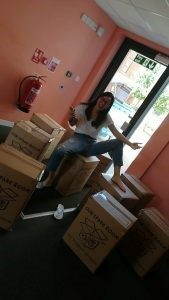 In last week’s blog we talked about the accommodation options available to you if you are going to be studying at both our Exeter campuses, or are studying at St Luke’s but want to be able to take advantage of the facilities at Streatham. This week, student ambassador Evlyn shares her experiences of living at Rowancroft. I remember when I had to choose accommodation for my first year, all that I was looking for initially was catered accommodation, haunted by the thought of having to cook my own meals! Little did I know that being assigned to live in Rowancroft, a self-catered accommodation, was one of many things that I am very grateful for. 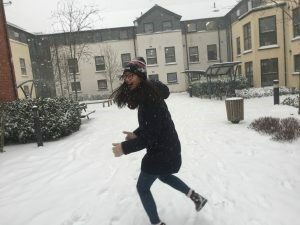 If you are comparing different accommodation options and are trying to learn more about what living in Rowancroft is like then read on – I’ll be sharing my personal experiences of living in Rowancroft and reasons why you might consider it! First things first, where’s Rowancroft? It’s in the Heavitree area of Exeter, it’s quite close to St. Luke’s campus, just two streets down from Waitrose. So yes, it’s off Streatham campus but if you’re like me who has lectures split between the two campuses, then Rowancroft is perfectly located for you. It’s literally a 5-minute walk to St. Luke’s and a 20-25 minute walk to Streatham. Located within walking distance from various supermarkets like Waitrose, Co-op, Tesco and Lidl means that it is also very convenient to get groceries whenever you want to. It’s also very near to the Pleasure Grounds, which is a nice public park which I used to run in each week. At Rowancroft, there are several types of accommodation divided into different blocks which have different types of rooms (some ensuite, some shared bathrooms, some studios), sizes and price range. . For Undergraduate students, the residences available are: Rowancroft Mews, Rowancroft Court and Rowancroft (Francis, Radford, Davies and Garden House) and for Postgraduate students the options are Rowancroft House and Rowancroft Studios. I lived at Francis House last year, which is an en-suite self-catered accommodation, so I shared a kitchen with my flatmates. As mentioned before, I was so worried in the beginning that I had to cook for myself, but the year ended up such an amazing opportunity for me to finally learn some basic culinary skills, engage in a lot of baking with my flatmates and bond with friends in the very spacious kitchen common space. I love my room at Rowancroft – it’s got all the essentials I’ve needed and even quite a large desk and bed! The interiors are also very well-maintained. Whenever we needed something fixed, the reception was very speedy at responding to our requests. I just love the welcoming and peaceful environment that Rowancroft gives you especially with the green space at the entrance. On sunny days, everyone gets out from their flats and plays ballgames on the field. Occasionally, when the Residence Life Team organises something, people gather around the field for free Hot Dogs or Ice-cream. And when it snowed last year, I remember, the field turned into a snowball-fight battlefield while small slopes at the back of the houses turned into sledging tracks! You can also meet a wide range of students living there. If you’re an international student like me, there’s nothing to be concerned about. And if you’re worried that all your flatmates are going to be medics based on St Luke’s, then don’t be: I’ve met loads of people doing arts, history, maths etc, so you’ll definitely not be alone. If you’re a post-graduate student, you can also rest-assured that you’ll be situated in a quiet, studious environment, with the option of choosing to live in a studio or standard room. In a nutshell, I’d say I’ve got a lot of fond memories of my time at Rowancroft. 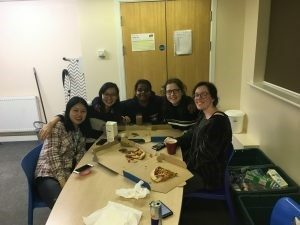 Choosing the right accommodation can be quite difficult and you might have already heard a lot of stories from students living at different halls. But I hope you’ve found my blog a little bit more helpful into showing you my perspective of what it’s like to be living in Rowancroft. This entry was posted in 2019/20, Allocations, Apply, New students, Postgraduate, Residence Life Teams, Residences, Self catered, Undergraduate and tagged 2019/20, apply, new students, postgraduate, residence life, self catered, undergraduate. Bookmark the permalink.